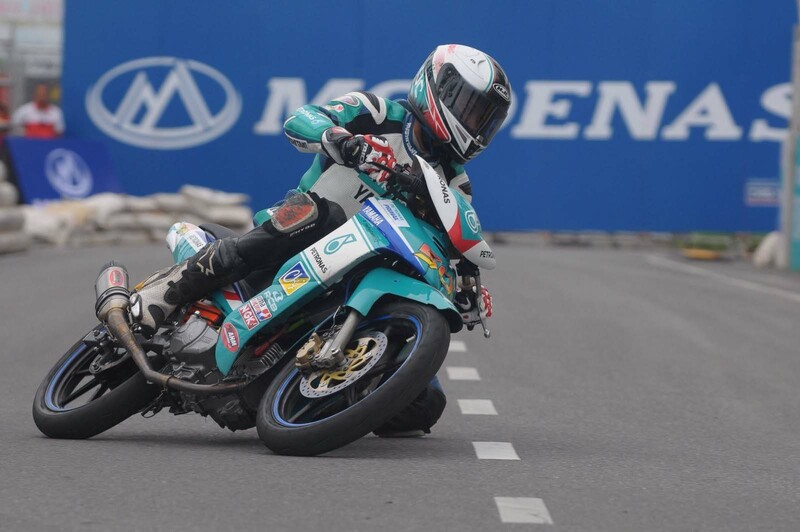 Ahmad Afif Amran enjoyed a competitive if not lucky start as he topped the CP130 opening practice for Round 6 of the PETRONAS AAM Malaysian Cub Prix Championship in Kangar, Perlis on Saturday. Refreshed from the long-season break, the PETRONAS Yamaha CKJ rider recorded the quickest lap in 42.828s early into the session but a misunderstanding with the team saw the Terengganu rider pit-in just after three laps. Currently Afif is ranked eighth overall in the CP130 standings with 38 points while Fazrul Sham leads with 70 points. Meanwhile Kasma Daniel Kasmayudin threatened to continue his winning streak when he dominated the CP115 practice. The PETRONAS Yamaha Maju Motor rider who has enjoyed three consecutive victories since Muar (Round 3) logged in the best lap in 43.691s with reigning champion, Izzat Zaidi Salehan (Motul Yamaha YY Pang) being the only other rider to clock his lap time under the 43 seconds benchmark in 43.762s. Third fastest for the intermediate class was Mohd Fareez Afeez (Felda PB Racing) with 44.114s while Tengku Amirul Haffiruddin and Azam Omar (PETRONAS Yamaha CKJ) rounding up top five. Lastly Khairul Ikhwan Ajis outpaced a dominant Harith Farhan Baharin to secure the fastest lap in the WIRA category. The Espada William Racing rider seized the timesheet in the dying minutes of the practice with 44.746s, forcing his Kozi Yam Honda rival to settle for second in 44.812s. Khairul’s teammate, Amirul Hakim Mohd Rizal came in third with 45.106s while Qhuwarismi Mohd Nasir (Westar Motorsport) and Izzat Rafiq (Team PETRONAS Yamaha) completed the top five.